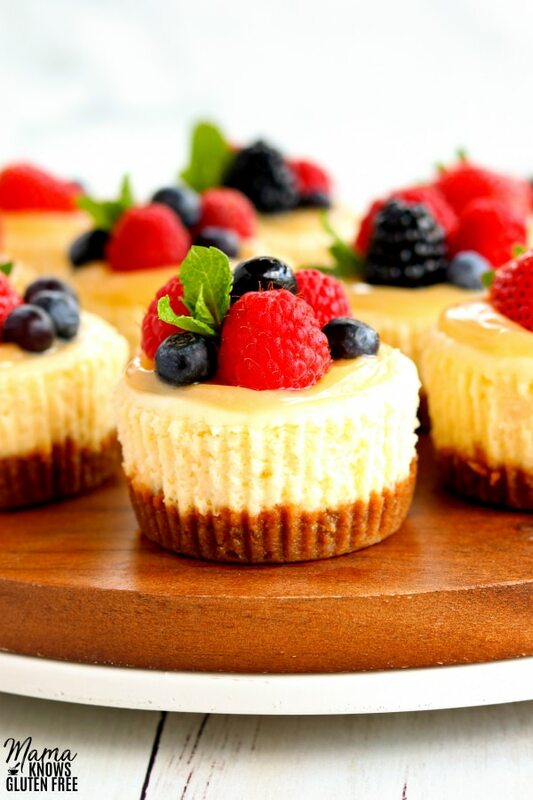 Gluten-Free Mini Cheesecakes are the perfect dessert bite! Everyone loves cheesecake, and these easy to make handheld bites are a rich cheesecake nestled on a graham cracker crust. Did you know you can easily bake cheesecake in a muffin pan? 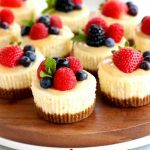 If you love cheesecake, but don’t want to bake an entire cheesecake, try these mini cheesecakes instead! These cheesecakes are baked in a standard 12-count muffin pan. There’s no need for a springform pan and or the mess with a water bath that a traditional cheesecake requires. If you have a muffin pan, cupcake liners and the few simple ingredients, you can have these mini cheesecakes in half the time of a traditional cheesecake. I love the traditional flavor cheesecake, so I wanted my mini cheesecake to also have a graham cracker crust. The filling ingredients of cheesecake are naturally gluten-free. The only ingredient that needs to be gluten-free is the graham cracker crust. I easily make gluten-free graham cracker crumbs by using Schär Honeygrams. I absolutely love Schär, and they make some of my family’s favorite gluten-free products! They have everything from certified gluten-free bread, to rolls, pizza crust, cookies, crackers, and snacks. I buy my favorite Schär products at my local Walmart. You can also use their store finder to see where you can find their products near you. Preheat oven to 350°F and line a 12-cup muffin pan with cupcake liners. To make the crust: crush the Honeygrams in a food processor or by placing the cookies in a plastic storage bag and crushing them with a rolling pin or your hands. Stir together the crumbs, brown sugar, and melted butter. Add about 1 1/2 tablespoons of the mixture into the bottom of each muffin liner and press down to make a crust. Beat the room temperature cream cheese with a mixer on low-medium for 1-2 minutes until fluffy. Beat in room temperature sour cream, egg, sugar, vanilla, and lemon juice. To avoid lumps, make sure your ingredients are room temperature. See the tips below on how to quickly bring ingredients to room temperature. 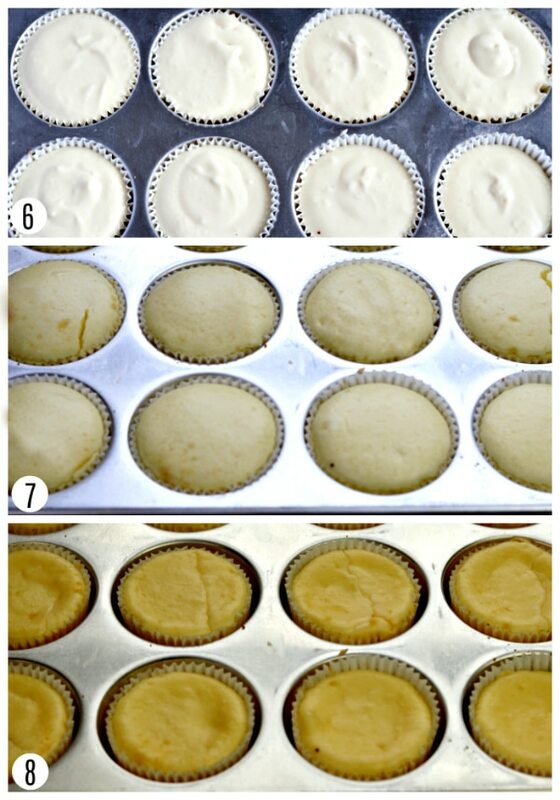 Using a greased cookie scoop, evenly divide the cheesecake filling among crusts, filling the muffin liners to the top. Bake for 20 minutes until they just begin to brown. When you bring the cheesecakes out of the oven, they will be puffy but sink once they cool. Cool completely and then cover and refrigerate for at least 3 hours to overnight. Allow the cheesecakes to thaw for 2-3 minutes before removing from the muffin pan. Serve plain or with your favorite toppings. Use room-temperature ingredients to avoid lumps in the cheesecake batter. You can quickly bring ingredients to room temperature by placing them in a bowl with warm water for 2-3 minutes. Do not worry if you cheesecakes crack on top. Once they cool they, will sink down and the cracks will fill themselves in. Can You Make Mini Cheese Cakes Ahead Of Time? Yes, you can! These mini cheesecakes are the perfect make-ahead dessert. Once the cheesecakes are completely cooled, cover and refrigerate. Do not remove the cupcake wrappers or add your favorite toppings until before serving. Yes, you can! You can freeze them either left wrapped in the cupcake liners or unwrapped placed in a freezer safe container. Make sure you freeze them plain without adding any topping. They can be frozen for up to 1 month. Simple defrost overnight in the refrigerator or on the counter at room temperature for 5-10 minutes. 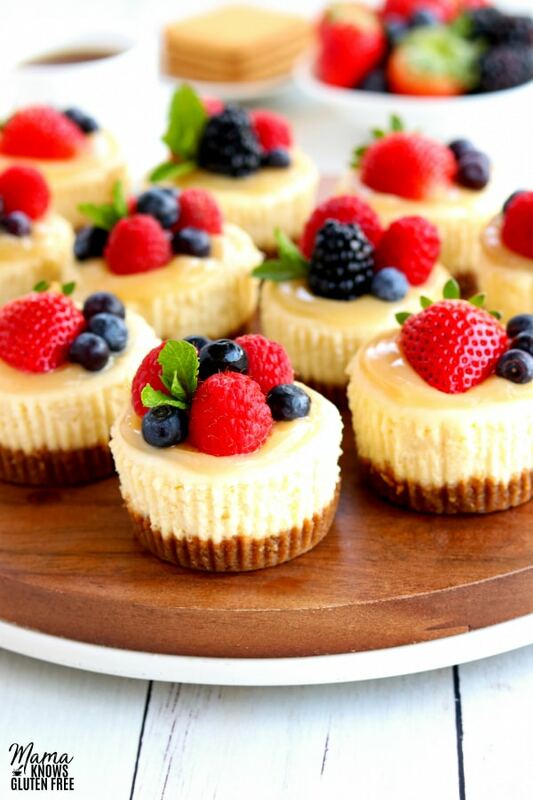 There are so many ways you can top these mini cheesecakes! They are delicious served as plain cheesecakes, but they are so fun to decorate with your favorite cheesecake toppings. One of the best things about these individual cheesecakes is that this recipe is so easy to make! I promise these are just as easy as making a no-bake gluten-free cheesecake. Making a baked cheesecake can sometimes be challenging with water baths and hours of baking. But not with mini cheesecake bites. They have an amazing baked cheesecake texture without all the time and work! This gluten-free mini cheesecake recipe is the perfect way to serve cheesecake to a crowd and is a party favorite for any kind of celebration! 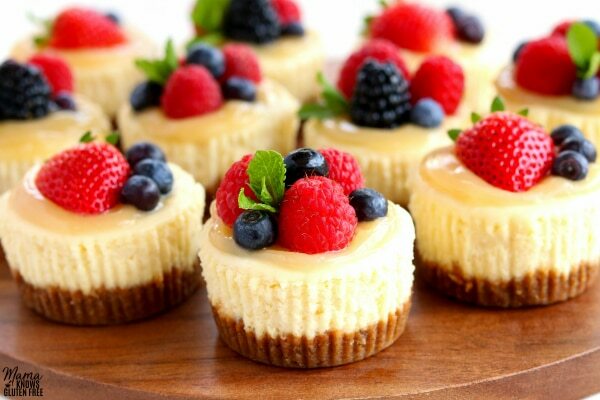 Gluten-Free Mini Cheesecakes are the perfect dessert bite! Everyone loves cheesecake and these easy to make handheld bites are a rich cheesecake nestled on a graham cracker crust. Preheat oven to 350°F. Line a 12-cup muffin pan with cupcake liners. Beat the room temperature cream cheese with a mixer on low-medium for 1-2 minutes, until fluffy. Beat in room temperature sour cream, egg, sugar, vanilla, and lemon juice. To avoid lumps make sure your ingredients are room temperature. See tips in recipe notes on how to quickly bring ingredients to room temperature. 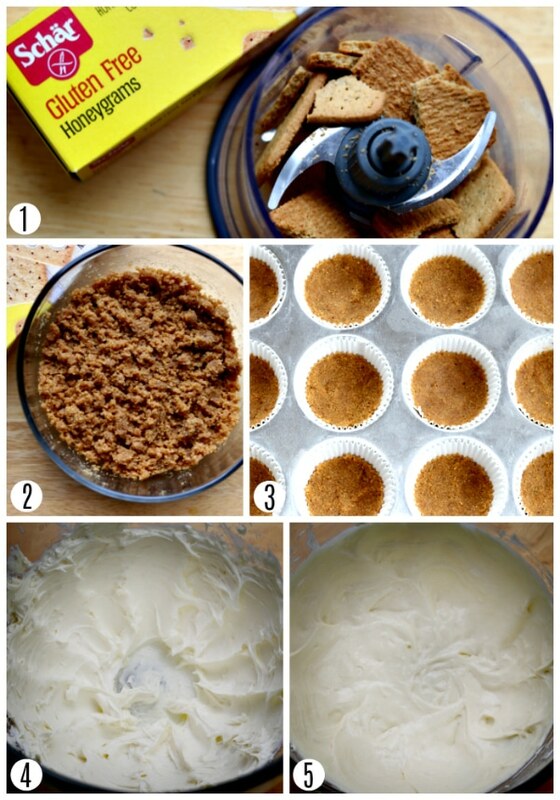 Using a greased cookie scoop, evenly divide the cheesecake filling among crusts, filling the muffin liners to the top. Bake for 20 minutes, until they just begin to brown. When you bring the cheesecakes out of the oven they will be puffy, but sink once they cool. Cool completely and then cover and refrigerate for at least 3 hours to overnight. Allow to thaw for 2-3 minutes before removing from the muffin pan. Serve plain or with your favorite toppings. Do not worry if you cheesecakes crack on top. Once they cool they will sink down and the cracks will fill themselves in. These mini cheesecakes are the perfect make-ahead dessert. Once the cheesecakes are completely cooled cover and refrigerate. Do not remove the cupcake wrappers or add your favorite toppings until before serving. You can freeze them either wrapped or unwrapped in a freezer safe container. Make sure you freeze them plain, without adding any topping. They can be frozen up to 1 month. Simple defrost overnight in the refrigerator or on the counter at room temperature for 5-10 minutes. Excellent recipe. I really appreciated that they store so well! Very yummy and easy too. Mama Knows Gluten Free nails it again!! 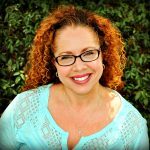 Thank you so much Brianna for the wonderful 5-star recipe review! 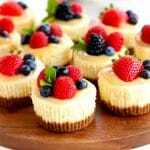 I am so happy that you enjoyed the mini cheesecakes, that you found the recipe easy and they stored well. You just made my day. Thank you again! These look perfect for a bridal shower I’m planning where some of the guests are gluten free. Thanks for the recipe! Hi Suzanne. These would be a perfect dessert for a bridal shower. You are so welcome. I hope everyone enjoys the mini cheesecakes!